This really caught my attention! 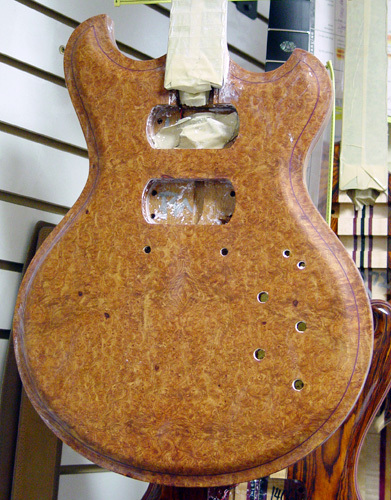 Can't wait to see this wall-to-wall burl when the finish hits it. That's one heck of a piece of wood! Gonna be amazing, I'm sure. May I introduce the guitar I commissioned, affectionately named Pele, after the Hawaiian goddess of fire. Needless to say, she's smokin' hot. Thanks go to Alembic, Uncle Bob's, and everyone else who helped make it happen. Thanks for the comments guys. This is going to be one special guitar. Pele is an awesome name. Awesome name for an awesome piece of wood...can you say CUSTOM-OF-THE-MONTH...I thought you could, LOL! As far as guitar COTM's, I wouldn't be so presumptuous with the many beautiful Furthers in production with the wonderful inlay work. I believe those have a much better chance than my simple idea. The elves have a very tough yet fun decision to make every month. Just going down the list in here, each one is deserving with a great story to tell. Your guitar just got the little dot inlays. The wood is just so amazing! Did I mention that the wood was awesome? It looks like it's on fire! Pele's smokin.' It looks like an inferno in there. Awesome! That is really, really, really amazing... How will this wood sound relative to maple or cocobolo? C'mon baby light my fire! Wow, so much more than I expected. Thanks Mica and everyone! A special thanks to Malthumb and his Marchlewski 5 string. His instrument was an inspiration for this as well. The noise you may have just heard was my jaw making contact with my desk!. I'm afraid I'll have to use the 'A' word again,but even *A*W*E*S*O*M*E*! * with a 21 gun salute seems too modest,I've never seen Amboyna like this before.The Santa Rosa Alchemists appear to have fused solid gold with marble,particularly in the 2nd of the 4 pics above.Mica,any chance of posting a link to 'Superlatives R Us'?.My vote for COTM.So beautiful. Beautiful! What a gorgeous piece of wood. Great choice Tom. Can't wait to see this all dressed up. Amazing! Looks like it was chiseled from stone. As a lover of exotic woods, I thought that I owned one of the nicest pieces of Amboyna burl in the form of an Elie Bleu humidor (stores cigars and keeps them fresh), that is, until I saw this incredible piece of art. Congratulations Tom on Pele, the soon-to-be Alembic goddess. Thanks Simon, Tom, Jonathan, and Jeff. Your kind thoughts are greatly appreciated. I agree with you Jeff about the art aspect. After seeing the guitar in its current state I am going to have a hard time justifying playing it once I get it home. But I'll find a way I'm sure. Due to the stunning nature of the outcome of the guitar, I had to dress her up with some custom knobs and an inlay. She's too pretty not to add a bit more mojo. And is that Pele's "heart" I see just under the bridge in the figuring of the wood? Justin, I haven't a clue with regard to the tone. I was hoping for visual impact, and of course they delivered way beyond my expectations. I'm assuming with the Mahogany body it will be pretty standard, but who knows? 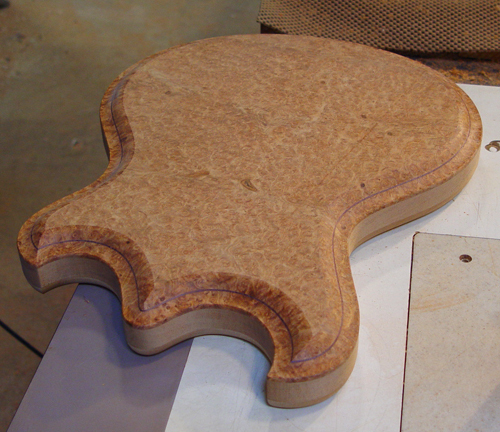 Since I added the inlay, and there's a long line in front of me, it's going to take a little while to find out. But I sure haven't been playing much guitar with my new bass around. Can't put it down. I can't wait to see yours. I have to say that, generally, I'm wary of burled wood because it can be hit or miss IMHO. However, I think that is one of the most beautiful tops I've ever seen on any instrument ever. Tom you're a very lucky man, and Mica and company are just amazing crafters. HOLY CRIPES!!!!! Absolutely INCREDIBLE wood! Front and BACK too??!!!!! I want one, I want one, I want one!!!!! I'm going to make a point of stopping in just to see it in person the next time I'm driving up 101. I'm almost speechless (typeless?). WOW! You lucky dog. Thanks Bill. No back lam, just covers. I'd love to hear your comments if you get a chance to stop by. I stopped by Alembic today on my way back from court in Santa Rosa. I made it a point to check out your axe. All I can say is WOW!!!! (Oh yeah, I aleady said that). How about incredibly amazingly outstanding? Of course that is still an understatement. It hadn't even been buffed out yet, but it still is one of the most gorgeous pieces of wood I have ever seen. You must have huge deposits in your bank account of karma to have this instrument come into your life. You're gonna love it! Thanks for checking on it Bill. Much appreciated. The anticipation grows every day. 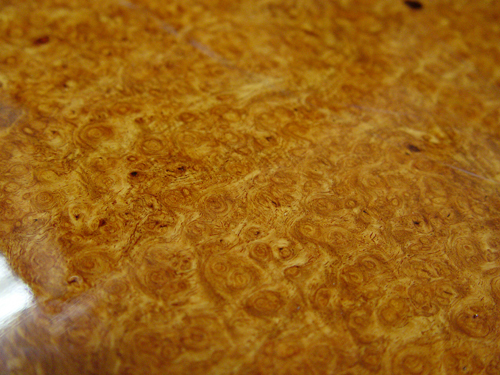 What does amboyna smell like? I am curious because I found out the hard was that zebrawood smells like urine when cut. I read that it actually has a pleasant aroma when cut. You'd have to ask them for sure. I recently drilled the holes for the switches, and I've still got the aroma lingering in my memory. I'd call it a masculine aroma, heavy on the creamy notes, almost similar to a Thai iced tea. Dark and warm with light hints of tobacco and perhaps a camphoric spice. Not so much sweet as savory and creamy. While I'd like to compare it to other scents of freshly hewn wood such as cocobolo or Madagascar rosewood, it's very unique. If I was forced to relate it to another wood, I'd say it has muffled tones of paduak. for anyone who is wondering, Peter is our carver these days and a very good one at that. Wow, how about that for a precise description! Did you, by chance, previously write for the J. Peterman catalog? Nice work, Peter. Stunning, Tom, best of luck. I agree with your comments to Peter. My thanks to him as well for his synopsis and his craftsmanship. Hi Pete!! Welcome to the board!! Thanks for the update Mica. AAAAAAAAHHHHHHHHH!!!!!!! 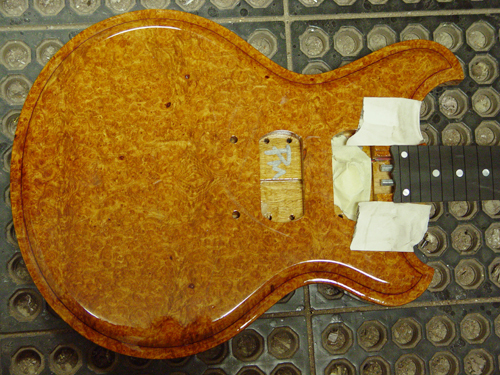 Is that my bass hiding behind that gorgeous Amboyna? It's great to know that such a fine instrument is keeping my baby company! Congratulations on your sighting, Michael. I'm starting to wonder if mine is like Mr. Snufalufagus and disappears every time I go looking. Just to stay somewhat on topic-- you've got to be super excited, Tom. That top has got to be one of the most beautiful I've ever seen. Thank's Mike. I hope some of your Series' magic rubs off on mine. What a GREAT instrument yours is! Love the neck choice. And thank you Brad, for two things. 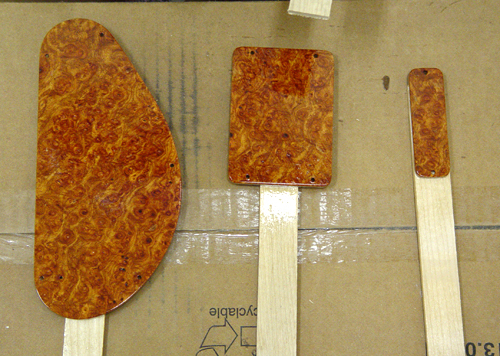 First, your comments here, and second, for picking out such a nice piece of CocoBolo for your custom. It appears the first top you picked out ended up on my bass and I LOVE it! I appreciate the time you spent there to find it. It went to very good use. I'm glad it went to good use! It was a nice piece, but I just fell in love with the one I finally settled on. That amboyna is really something, though. It is quite stunning, in a very literal sense (I know that word gets over-used). I hate to even ask... but I must. Dollar signs tend to spoil the mood, so perhaps a pvt reply would keep the mood alive (daus.mahnke@gmail.com). Hi Daus; welcome to the board. The list price for a Skylark can be found on the Alembic site. This guitar obviously has some custom features that would add to the cost. Prices also vary significantly depending on the monthly special in effect at the time of your order. Final cost can also vary depending on the dealer with whom you place your order. I prefer not to answer that question, but thank you for your interest. I'm sure Alembic can find more of this amazing wood, and with the February special you can probably get one at reasonable cost if you act before the end of the month. I made sure the monthly special was to my advantage when I ordered this guitar. I saw your guitar today with the inlay. Yummmmm. I think you're going to like it. Thanks for keeping an eye on her. I was wondering, is the color really as bold as the first couple pictures show? I don't know if my monitors are tricking me. Thank you for your kind words. I'll be paying these off for a few more months if you know what I mean. But I do love the guitar. Pretty wood and LED's aside, to have an Alembic made with your choice of neck profile and frets is the ultimate. I'm back to D'Addario's and it sounds great.